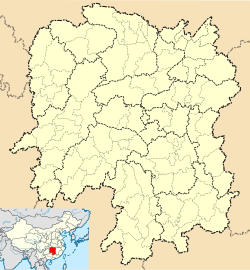 The origins of the name "Changsha" is unknown. The name first appears in the 11th century BC, during the reign of King Cheng of the Zhou dynasty: a vassal lord from the Changsha area sent a type of softshell turtle known as "Changsha softshell turtle" (simplified Chinese: 长沙鳖; traditional Chinese: 長沙鼈; pinyin: Chángshā biē) to the Zhou king as a tribute. In the 2nd century AD, historian Ying Shao wrote that the Qin dynasty use of the name Changsha for the area was a continuance of its old name. Most of the rivers in Changsha belong to the Xiang River system. In addition to the Xiangjiang River, there are 15 tributaries that flow into the Xiang River, mainly including Liuyang River, Laodao River, Minjiang River, and Qinshui River. There are 302 tributaries that are more than 5 kilometers long, including 289 in the Xiang River Basin. 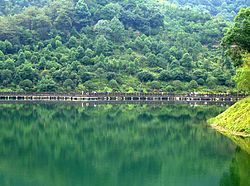 According to the tributary grading: 24 primary tributaries, 128 secondary tributaries, 118 third tributaries, and 32 tributaries; and 13 are Zijiang water systems; a fairly complete water system is formed, and the river network is densely distributed. Hydrological characteristics of Changsha: the water system is complete, the river network is dense; the water volume is more, the water energy resources are abundant; the winter is not frozen, and the sediment content is small. The geological features of Changsha City are: the formation is fully exposed, the granite body is widely distributed, and the geological structure is complex. The strata of each geological and historical period are exposed in Changsha City, and the oldest stratum is formed about 1 billion years ago. About 600 million years ago, Changsha was a sea, but the sea was not deep. Later, seawater gradually withdrew from the east and west, and most of Liuyang, Changsha, and Wangcheng rose out of the sea and became the northwestern edge of the ancient land of Jiangnan. About 140 million years ago, the sea leaching in the Changsha area ended and it became a land. Due to the influence of crustal movement and geological structure, a long-shaped mountain depression basin, the Chang (Sha) Ping (Jiang) Basin, was formed. Beginning of the new generation, the entire Changping Basin has risen to land. About 3.5 million years ago, the third ice age occurred on the earth, and Liuyang retained the remains of glacier landforms. During the Warring States period, Qu Yuan, a great patriotic poet, recorded many dishes in Hunan in his famous poem "The Soul"（招魂）. During the Western Han Dynasty, there were 109 varieties of dishes in Hunan, and there were nine categories of cooking methods. After the Six Dynasties, Hunan's food culture was rich and active. The Ming and Qing dynasties are the golden age for the development of Hunan cuisine. The unique style of Hunan cuisine is basically a foregone conclusion. At the end of the Qing Dynasty, there were two kinds of Hunan cuisine restaurants in Changsha. In the early years of the Republic of China, the famous Dai (Yang Ming) School, Sheng (Shan Zhai) School, Xiao (Lu Song) School, and Zuyu School appeared in various genres, which laid the historical status of Hunan cuisine. 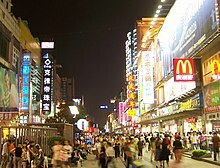 Since the founding of New China, especially since the reform and opening up, it has been better developed. Changsha snacks mainly include taste shrimp, Changsha stinky tofu, sugar oil glutinous rice, yellow duck called, Deyuan buns, spicy chicken, Yang Yuxing and so on. ^ Duxiu Chen; Gregor Benton (1998). Gregor Benton (ed.). Chen Duxiu's last articles and letters, 1937-1942 (illustrated ed.). University of Hawaii Press. 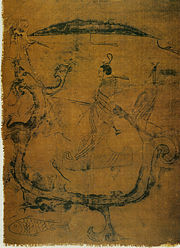 p. 45. ISBN 0824821122. Archived from the original on 16 May 2016. Retrieved 2 March 2012. 24. Xi'an never fell. 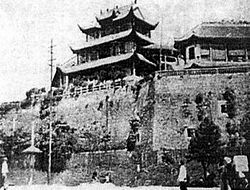 Under the Guonaindang General Xue Yue, Changsha was successfully defended three times against the Japanese; Changsha (and the vital Guangzhou-Hankou Railway) did not fall to the Japanese until early 1945. ^ "Changsha". www.xinli110.com. Retrieved 1 April 2019. 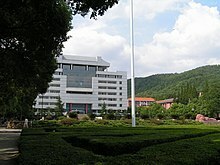 ^ "Environmental Resources in Changsha". 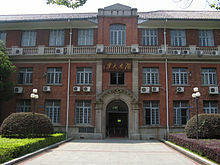 www.changsha.gov.cn. Retrieved 1 April 2019. ^ "Hunan cuisine". www.china.com.cn. Retrieved 1 April 2019.